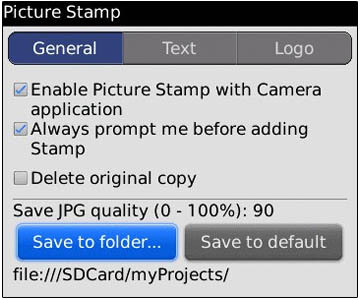 PictureTimeStamp - Easily add text and logos to pictures on your BlackBerry! PictureTimeStamp by Toysoft Development Inc is a really handy new app just released in the CrackBerry store. If you've ever had the need to watermark a picture on the go, or add time/date stamp to a picture, this application is perfect for you. Easy to set up, you'll be snapping pictures and adding text or logos to them in no time! Even pictures you have already taken can have the text or logo added to them. Personally, my first thought when I saw this app was "Cool! Now I can add sappy notes on all those pictures of the kids I send to Bla1ze!" PictureTimeStamp is a valuable tool, and whatever your needs are, I think you'll find an option that will suite you. The full version is only $2.99, and with a free trial available, you really can't go wrong. Download it today, and let us know in the comments what creative ways you find to use PictureTimeStamp!